Storm Surge at Montgomery Botanical Center by Gregory Barber. In addition to excellent growing conditions, South Florida also sees occasional hurricanes, which present a challenge to plant collections. Through vigorous curatorial efforts, those events can also provide opportunities for research. Montgomery Botanical Center staff presented collections-based research at Botany 2006 that was informed by 2005's hurricane season. Carribean palms are more wind resistant. See our 2008 scientific paper, in Annals of Botany. There is a strong correlation between geographic origin and hurricane survival -- evidence of natural selection. Again, Caribbean palms are most resistant, even when accounting for stem thickness. The results are in our 2013 study, published in PALMS. Montgomery shared its hurricane plan with the public garden community in 2016 (just in time for Hurricane Irma). Following Hurricane Irma, the Montgomery Team took a long view of how plant collections change over time. The study was featured on the cover of Curator: The Museum Journal. Prior to Hurricane Wilma, MBC refined its hurricane response protocols. These protocols were also used in Hurricane Irma. Below are links to pages showing some of the damage the collections sustained from the hurricanes that impacted Montgomery Botanical Center, including our cleanup and recovery efforts. Ongoing research is looking at potential spatial relationships or patterns in the observed hurricane damage. 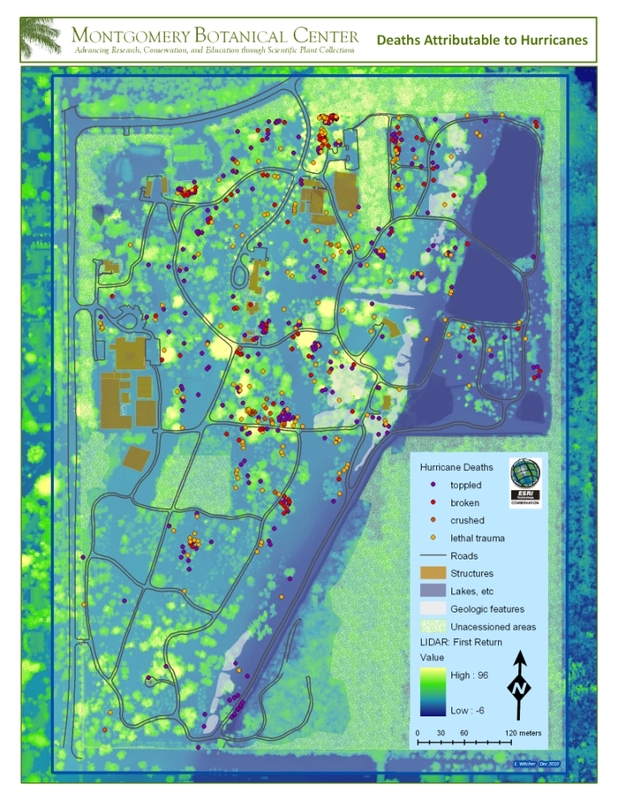 In this map, the locations at MBC of the plant deaths that were caused by hurricanes are seen at a glance. 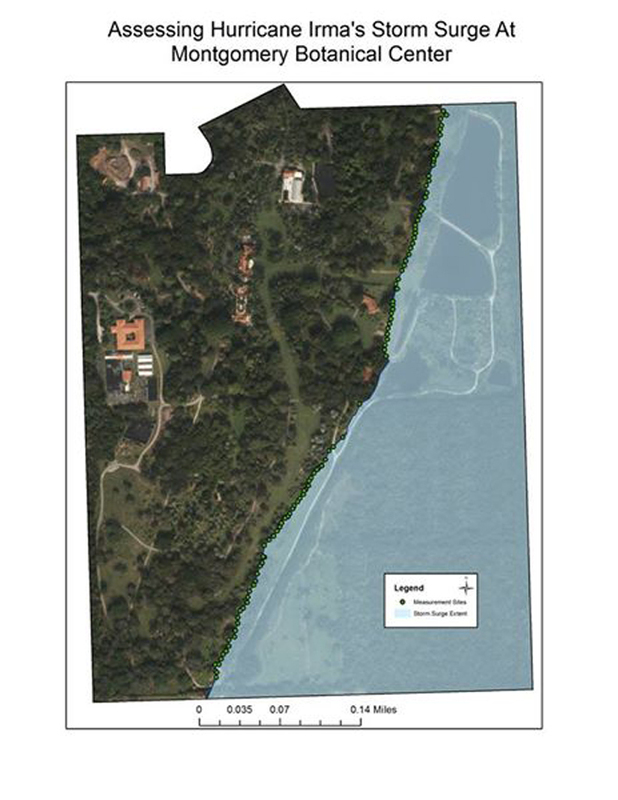 GIS staff overlaid the locations on a LIDAR First-Return image to get an idea of the canopy coverage and open space around the various sites. These locations can then be cross-referenced by species, genus, origin, or many other factors when examining the impact of the storms in more detail.